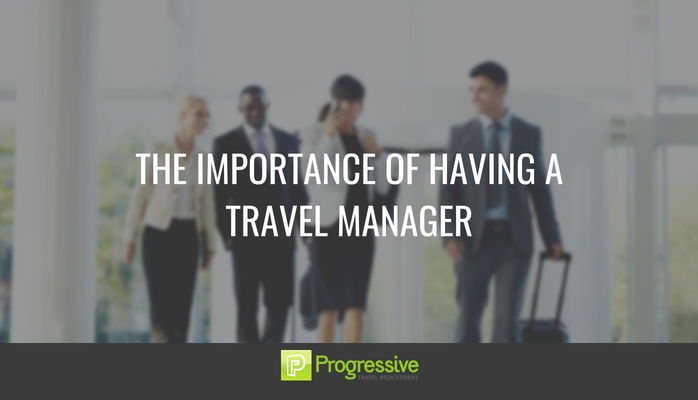 Many companies already realise the importance of having a dedicated travel manager. Here, Progressive Travel Recruitment director James Roberts and management consultant and director of our sister company 14fiftyseven Susie Osborough answer questions about why hiring a travel manager can make all the difference to a company, keeping employees on side and ultimately being a wise investment. Susie: A travel manager is responsible for organising travel for employees in a company. They also look after staff’s needs when travelling. This involves procuring services via a travel management company (TMC, i.e. a business travel specialist) or booking directly for flights, trains, hotels, car hire, transfers, etc. James: Travel managers and their teams manage and constantly review travel supplier costs, supplier quality, supplier suitability, the relationship with their business travel agency or travel management company, the welfare of their colleagues, internal communications about everything travel, devising and enforcing a travel policy. Increasingly, the best potential employees will look for companies with good travel policies, and having an effective travel manager in place will be the first step towards attracting these people. Why hire a travel manager? Susie: Having an in-house travel manager allows staff to focus on their own jobs, rather than waste time searching for options that don’t always represent best value. It also demonstrates a company’s commitment to managing their travel programme with a dedicated professional who will manage the logistics of itineraries and costs. Travel spend is often the highest expense after payroll, yet many companies leave it to chance with no measures in place to monitor the spend or time wasted booking trips. 1. Managing costs. This is achieved by strong negotiations with local, national and international suppliers, including securing good booking terms and additional benefits. A travel manager will monitor the performance of the travel management company, and check adherence to service level agreements (SLAs). 2. Delivering suppliers that meet the needs of the business, for both regular travel arrangements and ad-hoc requests at any given time. 3. Ensuring staff welfare when travelling. Working with a reputable TMC ensures the travel manager knows exactly where travelling staff are at all times, and that they have a secure point of contact if any issues arise. Does hiring a travel manager save a company money? Susie: Initially, paying someone to organise travel can appear to be a luxury. However, if a company assessed hours wasted on search time and hassle, savings quickly become apparent. A good travel manager will produce a travel policy that demonstrates savings, choosing from multiple options. They spend the time assessing what makes value for money, whether that’s booking a flight an hour later to save money, or a hotel a block away may represent better value, while still having all the essential services. They get to know the market and use it wisely. James: A good travel manager does save money but also knows that travel isn’t just a commodity and never will be. A travel manager needs to consider all the variables and the cheapest option may not be the one to go for in all cases. They will source the most appropriate services, and choose with knowledge and confidence. They will consider reliability of suppliers (airlines, hotels, etc.) not just cost. And whether flight times work for the business’ needs and the individual’s personal life. They know that it doesn’t make sense for an employee to arrive exhausted for a meeting, so will factor that in. An employee may achieve more revenue for the business if treated with a little luxury. Penny pinching companies aren’t always the most successful. What sort of companies hire travel managers? Susie: Those that value the welfare of their employees. As an employer, asking your staff to travel also involves you taking their welfare seriously when away from home. A travel manager will fulfil that duty of care. James: Any company can have someone who is responsible for travel spend. For a smaller company it might be a travel manager or coordinator, but for a FTSE 100 company you might be looking at a team in excess of 20 people. In a large company, how should you structure your travel-management team? Susie: For an office with upwards of 10 travellers I would appoint two people, perhaps a travel manager with an assistant to cover admin but who could also take responsibility during holidays and provide backup. For a team of over 20, two travel managers would be required. If a TMC is not used, then one needs to think how the team will offer support 24/7. James: The structure of any travel management team is dependent on each business. If you are just considering a travel expert then click here to connect with me. For some companies the structure is more flexible. We can supply experienced in-house travel managers and co-ordinators to all sizes of corporates. Worried a travel manager won’t be worth the expense? Susie: Travel Managers are often seen as an unnecessary expense with many companies opting instead for a DIY self-booking tool. Those tools are not always intuitive and cannot replace an expert searching multiple options. Sometimes going by rail or road is easier than a flight, particularly in Europe, but the user has to know to search this not just rely on what a booking tool offers. Leave the experts to do what they do best for their company and let a travel manager demonstrate their expertise. James: It’s not a one-size fits all solution. As an employer you need to develop an exceptional relationship with your TMC, and treat all your suppliers with respect so that they will look after you. I say this from a lot of experience on both sides. If you purchase product with integrity and realise that travel policy is now seen as a key decision maker for potential employees, you will realise it is worth the investment. Good people will go to companies who look after their staff while travelling, and crucially, they’ll stay with them, too. If you have any questions regarding hiring a travel manager, connect with me on LinkedIn here or call 0203 490 4746. We supply experienced travel managers at every level.